Published in 1962, The Kindly Ones, draws as much inspiration from contemporary events at the time of its writing as it does the events leading up to the Second World War which is the point that the narrative has reached in the sequence of novels. D.H. Lawrence’s Lady Chatterley’s Lover had just been published by Penguin and is discussed by the narrator Nick Jenkins and a friend at some point in the late 1920’s or early 1930’s, presumably both having had access to the privately published edition (Italian from 1928 or the Mandrake Press edition of 1929, though the bowdlerised 1932 version might also be possible). This discussion takes place at the start of the second chapter, the first chapter having been devoted to an incident which took place on the eve of the First World War (in fact on the day the Archduke was assassinated in Sarajevo precipitating the crisis which led to the war). This earlier incident focuses on three servants – the first time Powell has devoted some 75 pages to working class characters rather than the middle class and upper-middle class characters who have been the exclusive centre of attention so far in the cycle – this being volume 6. The subsequent conversation by the two middle/upper-middle class characters therefore provides a frame for the earlier incident and detached commentary on it. They wonder what married life is like for the servant/working-class. I cannot help but wonder whether the timing of this first inclusion of an entire chapter in which the principal characters are the working class servants is merely coincidental given that such subject matter was topical and controversial at the time of writing. Is Powell jumping on a bandwagon or providing an ironic commentary upon the bandwagon? Later in chapter two there is a dinner party at Stourwater, hosted by the magnate Sir Magnus Donners (pictured above by Mark Boxer for the cover of the Mandarin edition), who, it is speculated at the time, might be brought into the government to use his business acumen to aid the preparations for the anticipated war. This party degenerates, at the behest of Donners, into a debauch with the attendees all acting out scenes depicting in turn the seven deadly sins, for him to photograph. The parallels are clear between this scene and the events at Clivedon in 1961 which emerged as a public scandal, the Profumo Affair, in 1962/3 but were no doubt known to those such as Powell who moved in the literary and upper-class society, given the hints and veiled references which appeared in various periodicals, such as in the gossip column of Society magazine Queen. 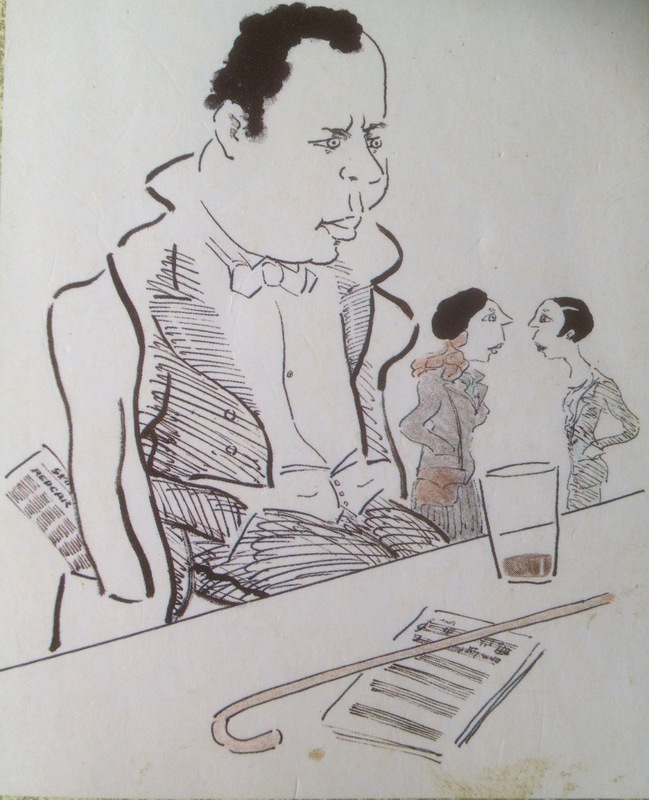 Powell is therefore drawing heavily on these current events for source material for his novel set at the end of the 1930’s and may be thought to be winking knowingly to those of his readers who shared the same inside knowledge when he used it in his novel. He ponders whether Giles has bent his surroundings to his will in both locations and likens this to the power of a photographer to make his images of different locations have an appearance of consistency – thereby reminding his readers of the photography hobby taken up by Donners in the previous chapter as a similar means to impose his will on the world and people around him. A more likely explanation, to my mind, might be that people are drawn to the same types of places when deciding where to live, but that would be inconsistent with Powell’s theme. Powell also has Uncle Giles express admiration for “the little man they’ve got in Germany now”. This preference on the part of the anti-authoritary figure Giles is explained by his seeing Hitler as a reaction against the established order. This perversity of view is perhaps the ultimate reflection of the book’s title. The Kindly Ones is a translation of the Greek Eumenides, the euphemistic, flattering name given to the Furies of classic mythology whose wrathful arrival served as the harbinger of war, famine, drought and pestilence, as if by so-naming them, the depredations that followed them might be put off. As with Hitler, this naming convention to ward off evil, appears doomed to fail as the sequence of novels continues into the Second World War. Filming has begun in Yorkshire for the new adaptation of The Moonstone due to be shown in the autumn over five consecutive afternoons on BBC 1. John Thomson (Cold Feet, The Fast Show) and Sarah Hadland (Miranda, The Job Lot) will play Sergeant Cuff and Miss Clack. They will be joined by rising stars of theatre Joshua Silver (Photograph 51, Wolf Hall/Bring up the Bodies) and Terenia Edwards (Hero’s Welcome, Five Finger Exercise) in television debuts in the central roles of Franklin Blake and Rachel Verinder – one of literature’s most enduring couples. The five part series will also feature Sophie Ward as Lady Verinder, Stewart Clarke as Godfrey Ablewhite, Leo Wringer as Betteredge, and David Calder as Mr Bruff. It is adapted for TV by Rachel Flowerday (Father Brown, EastEnders) and Sasha Hails (Versailles, Casualty) and made by King Bert Productions. The series will be directed by Lisa Mulcahy (Red Rock, The Clinic) and produced by Joanna Hanley (Billionaire Boy). I was always taught to structure anything I wrote giving it a Beginning, a Middle and an End. If we ignore the spellchecker which just transformed that into a Beginning, a Muddle and an End this might be restated as: say what you’re going to say, say it, then say what you’ve said – the classic introduction, subject, conclusion structure. Powell messes with this formula throughout his A Dance to the Music of Time, but nowhere more clearly than in the fifth volume, Casanova’s Chines Restaurant. He abandons linear narrative so thoroughly that within the first two pages the reader is taken from a memory of a post-war incident to the pre-war incident which took place at the same location during which the narrator Jenkins recalled a prior event at the same location with Moreland (pictured above in the cover illustration), whom he has introduced as his companion at the time of the intervening event as well, saying he is one of his most long-standing friends despite this being the first occasion he is mentioned in the sequence of novels. One is tempted to wonder if this is a deliberate, long-planned introduction of this character or if this is merely a convenience for the writer who found he needed a new character at this point in the cycle to address ideas he only now had come up with and wished to expand upon. Whichever side of the planned/unplanned divide you fall, as a reader Owell now uses this device of multiple parallel developments to present a series of perspectives on relationships and in particular marriages through highlighted contrasts in the relationships of the narrator Nick’s in laws. Being a large family, this offers scope for both successful and unsuccessful marriages to be scrutinised closely. He does this by focussing on different aspects in each relationship. 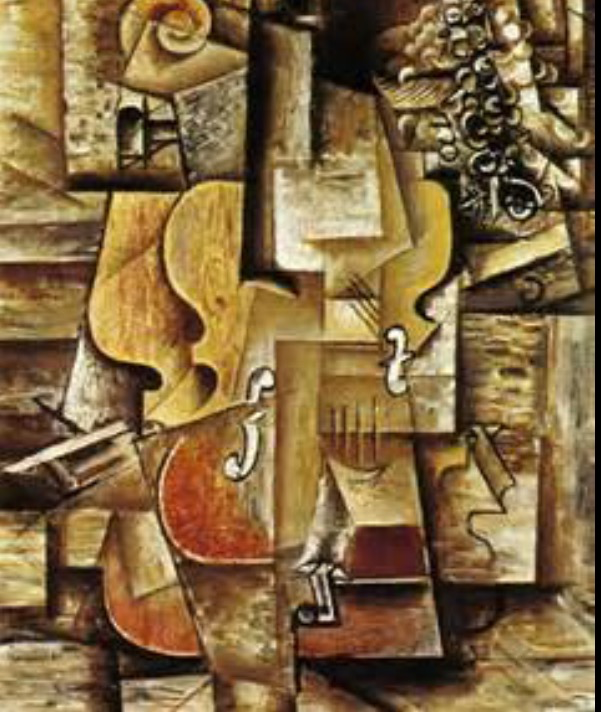 Rather than creating a single coherent, orderly whole this gives a multi-angled, conflicting but ultimately deeper and broader rendering of his subject, resembling more the disturbing, fragmentary, cubist imagery of Picasso which somehow says more about a violin as a music-making instrument than any realist representation ever could. Indeed Powell here introduces a group of musicians and music-critics, having previously focused on literary figures and painters and sculptors whose art is necessarily static. Attempting to capture one art form, music, that exists in time in another art form, literature, which is similarly temporal creates its own challenges. Both music and literature may be captured on the page but are not pinned down by this process. A musical score can be realised in radically different ways by different performers. A novel requires the active engagement of the reader to produce a sequence of mental images based on the words taken from the page. No two readers will produce identical internal images (even if both have, for example, seen the same illustrations of key scenes – indeed the extent to which such visual cues may be ignored by the reader if they conflict with a prior mental image conceived by the reader can be huge). Thus each reader’s construction is unique and personal. Indeed it may be changeable as the reader progresses through a novel. Just as the musician can only read a single page of a score at a time and the reader can only be reading a single page of a novel at a given time, each reading of that fragment of the whole is coloured by knowledge of the whole (whether this is a first teading or a re-reading). Indeed this may be one of the great joys of re-reading a familiar text: that details which hitherto had escaped the reader are suddenly and delightfully brought into sharp focus. Which may serve as my excuse for returning periodically to familiar novels to re-read them and enjoy fresh insights into the author’s vision. Oare Church lies in a secluded valley just inland from the North Devon/Somerset coast. I reached it by way of a tramp across Exmoor covering some 9 miles (it should have been 8 but I got a bit lost on the way over the moor with its multitude of criss-crossing tracks) and 3 slogs up the sides of steep valleys cut by the fast-flowing rivers which also divide the moor and 2 scrambles down slippery tracks to return to lower altitude. Needless to say, this being the height of the English Summer, it rained off and on the whole four hours of the walk. True, there was a variety of rain: hard, driving downpours which stung as it was flung horizontally in my face by the wind; the persistent, insinuating drizzle that somehow permeates through your clothes, even those guaranteed to be waterproof for your lifetime and that of your children’s children; and the soft, pattering kind which drives you mad by stopping and starting so you’re always one step behind – either you have just spent ten minutes dragging on the waterproofs only for it to stop, or else it restarts within moments of you having stripped off the waterproofs for a better view and to be less encumbered as you wade through the sea of heather. But I finally reached my destination by way of the Badgworthy stream valley in which much of the action of R.D. Blackmore’s novel Lorna Doone takes place. Here I found the little village church at Oare in which Lorna is shot by her would be suitor, the terrifying Carver Doone, who fires at her through a window of the church as she is about to be married to her true love John Ridd. For the record – the window is the one you can see in the lower middle section of the church in the above photo. And this is the window from the inside and the view towards the alter end where Lorna would have been standing for the ceremony.